As part of China’s successful bid to host the 2008 Summer Olympics in Beijing, a range of marketing campaigns were rolled out. And one of the most talked-about exercises — a 13,112-meter-long artwork entitled Olympic dragon that covered part of the Great Wall — involved a Malaysian diplomat. Abdul Majid Ahmad Khan, who was then posted in Beijing as ambassador to the country, was personally involved in discussions as he was a friend of Pop Zhao, the Chinese artist spearheading the project. It is hard to say if the project helped tip the scales in China’s favor. But it may well have played a part in Abdul Majid’s selection as a torchbearer at the Kuala Lumpur leg of the Olympic torch relay to “reflect the people-to-people friendship between the two countries in sports”. The move also illustrated how he is held in high regard by the Chinese. 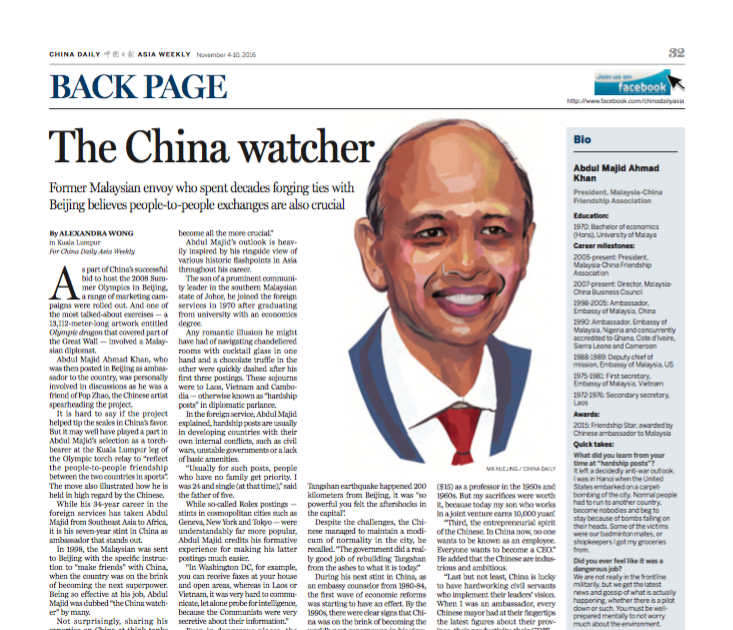 While his 34-year career in the foreign services has taken Abdul Majid from Southeast Asia to Africa, it is his seven-year stint in China as ambassador that stands out.